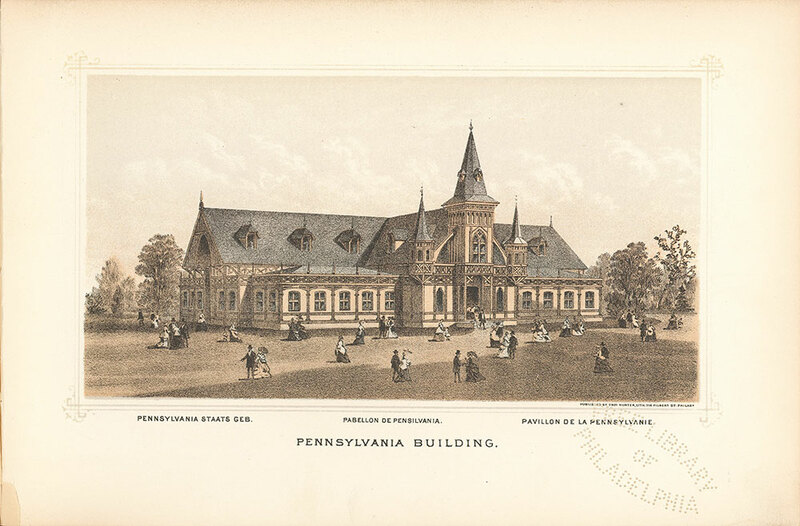 Notes: "Pennsylvania Staats Geb., Pavillon de la Pennsylvanie." The State of Pennsylvania, which gave generously toward the cost of the great Exposition, was tardy in making arrangements for the accommodation of its own officers and people. The time for holding the Exhibition had nearly come before the Legislature made the necessary appropriation. The plans had been prepared and everything was ready when the contracts were authorized. When the building was commenced, it was pushed forward with such rapidity that it was ready for use a few days after the Exhibition was opened. The structure is situate south of Fountain Avenue, north of Machinery Hall, near the west end of the lake. The architecture is in the Gothic style, ornamented with a central tower 165 feet high, which is flanked by two smaller octagonal towers connected with the principal one by flying buttresses. The building is of wood, and is surrounded by a tasteful piazza six feet wide. The dimensions are 60 x 100 feet; the height to the eaves is 22 feet, from which ascends the slanting roof 17 feet, making the height to the peak 39 feet. The roof is covered with slate, and is pierced by dormer windows. At the east and west ends a Gothic porch opens, extending in the gable near to the peak of the roof. The interior contains a main hall, 30 x 50 feet, two parlors, each 20 feet square, with dressing-rooms and other conveniences attached. There are two committee-rooms also. The Pennsylvania State Commission and the State government occupy this building as their headquarters, and it will be a place of resort for the people of the Commonwealth. Architect, H. J. Schwarzmann; builders, Peters & Burger, of Lancaster, Pa. Cost, $15,000. Notes: Architects: H.J. Schwarzmann and Hugh Kafka. Notes: The Building, situated in a grassy field, with people strolling in the foreground.